So what's really in an inspection? Noles Inspections is the best choice for your Houston area home inspection. A husband and wife team, both licensed professional inspectors, mold inspectors and indoor air quality inspectors, including additional ICC certifications such as ICC Residential Building Inspector. We have years of prior training, licensing, certifications and real world experience in residential, commercial building and Inspections, plus actual hands on building experience from the ground-up construction process. Our fees are very reasonable in which you receive a much higher quality report than other inspectors can provide. Home inspections are not created equal and we provide only the best service possible! We provide inspection reports the way a report should be made, containing sound information for the road ahead. Please read the reviews below and find more on Google, Yelp, the BBB and others! Noles Mold Inspections LLC can help! 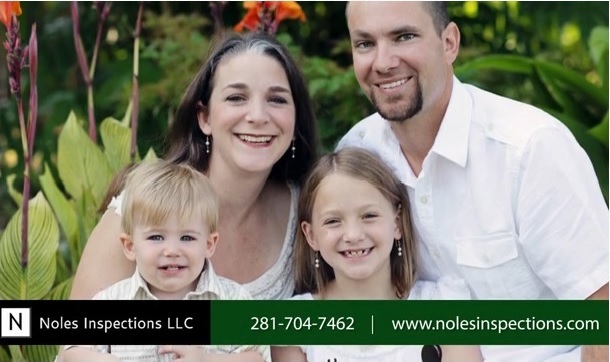 -Mold and Indoor Air Quality testing performed and provided by Noles Mold Inspections LLC. Noles Inspections includes the latest in cutting edge technology during every inspection! No one else can offer you our high level of inspection quality for the price! Check out the Technology Tab. Noles Inspections proudly serves the Houston, Texas Metropolitan area as one of Houston's best home inspectors. ﻿ Noles Inspections provides Houston home inspections in Maplewood South, Meyerland, Bellaire, West University, River Oaks, Galleria, Downtown Houston, Rice University, Midtown, Medical Center, Rice Village, Astrodome, Montrose, The Heights, Heights Area, Hedwig Village, Pearland, Westchase, Webster, Telfair, Sweetwater, Sugarland, Sunnyside Place, Spring Branch, Stafford, Spring, South Houston, Southside Place, Sienna Plantation, Sealy, Sharpstown, Sante Fe, Riverstone, Richmond, Rosenburg, Piney Point Village, Pasadena, New Territory, Missouri City, Mission Bend, Memorial, League City, Klein, LaPorte, Kingwood, Inner Loop, Katy, Jersey Village, Hunters Creek Village, Iowa Colony, Hempstead, Humble, Greatwood, Garden Oaks, Fulshear, Friendswood, First Colony, Copperfield, Cypress, Conroe, Lake Conroe, Bentwood, Cinco Ranch, Clear Lake, Champions, Champions Forest, Brookshire, Bunker Hill, Bridgelands, The Woodlands, Woodlands area, Tanglewood, Tomball, Uptown, Uptown Park, Webster, Galveston, Harris county, Austin County, Fort bend County, Montgomery County, Austin County, Waller County and everywhere in between! Below is an example of the continuing education courses that we take every year to ensure we stay on top of new information for you! This is all in addition to the licensing requirements and degrees that Case and Darin Noles both hold.